One side benefit of the busy, slightly weird and somewhat fouled-up time I’ve been having at the Los Angeles Film Festival is that I’ve only had time to watch films I’ve especially wanted to see. That’s prevented the joy (so far) of making an unexpected discovery, which is definitely part of the fun of film festivals. On the other hand, I’ve liked all the films I’ve seen (so far). 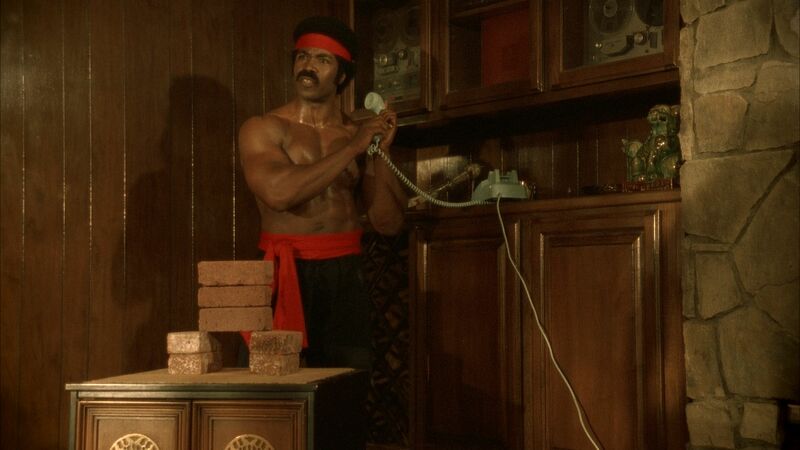 “Black Dynamite,” a spoof of the seventies blaxsploitation genre, is one I’ve been wanting to see since the filmmakers’ commendably aggressive PR people sent me a trailer — and a very cool (but inexpensively seventies-esque) t-shirt — a couple of years back via my personal blog. Fortunately, the wait, the slog through Hollywood traffic on the somewhat spooky evening of Michael Jackson’s death (not as bad as it could have been, actually), and even some technical problems on the first attempt to run through the film all proved to be very much worth it. Directed by Scott Sanders and co-written with actor and martial artist Michael Jai White (“Spawn,” “The Dark Knight“), this is just your basic story of a superhuman ex-CIA agent, able to take out a roomful of bad guys and satisfy a roomful of women, who sets out to avenge the death of his brother, stop the scourge of hard drugs at orphanages, and also deal with a brand of malt liquor that turns out to have a truly disturbing side effect. The brilliance of Sanders and White’s approach here is the faithfulness they maintain to their source material while sending it up shamelessly. It happily exaggerates the cinematic flaws of actual blaxsploitation and its often unbelievable plots and absurd dialogue, taking several increasingly silly turns as the film unspools, but always with a completely straight face and an apparent complete lack of irony. The approach propels the comedy far further than less disciplined spoofs. In a video interview conducted with writer David Poland after its debut at Sundance, Scott Sanders said he and White approached it not so much as a movie starring Michael Jai White as Black Dynamite and directed by Sanders, but a movie featuring Michael Jai White playing seventies-era ex-football player Ferante Jones playing Black Dynamite, and directed by Sanders “playing” a seventies director. Lest you think this is in any way subtle, the silliness level increases exponentially as the action continues and arguably goes one (still funny) bridge too far in the final action sequence — but the dead serious attitude winds up fueling the almost Mel Brooksian frequency of the jokes, even while some in-jokes may fly by the uninitiated. I’m sure I missed some of the deeper blaxsploitation references, since I’m still a fairly casual fan of the genre. I definitely caught a running gag that non-Angelenos may miss, relating to the venerable L.A. soul food chain, Roscoe’s Chicken and Waffles and its fictional precursor, Roscoe’s Chili and Donuts. The film is competent in very much the same ways as many of the films of the period — and perhaps just a bit more than some, particularly in terms of fight choreography. Anyone whose seen White’s deleted fight with the late David Carradine from “Kill Bill: Volume 2” knows the massively proportioned actor is also a first-rate martial artist, and White — giving the kind of make-or-break comic/mock serious performance that should be Oscar nominated but never, ever will be — and Sanders do a superb job of making his skill serve the comedy rather than distracting from it. All in all, this is first rate movie spoofery that I hope will appeal to a fairly wide audience, but will obviously hold a special charm for film dorks. It may not hit the same mass appeal notes as “Airplane,” but this is probably the closest and most successful comic recreation of a bygone movie style since Mel Brooks captured the look and feeling of classic-era Universal monster movies so beautifully in “Young Frankenstein.” I could go on about this, but I fear I’m not really conveying how this actually works. What you see below might do better. Why do you think they call them “Titans”?